The transaction is expected to close on April 17 when shareholders at both companies have to vote on the transaction. The company has obtained the required regulatory approval for this deal from the Mexican government and it doesn’t need to obtain financing. I think that this is a deal that is almost certain to go through. Usually when this is the case the spread between the two stocks is so small that there is little money to be made in the merger arb. When we value SpinCo at only its cash/share value the current spread is roughly 4%. That’s in my opinion already pretty attractive, and their gold deposit is presumably worth something as well. Perhaps a hint of its value can be extracted from the price that Coeur will pay for its 4.9% interest: $1.47 million. 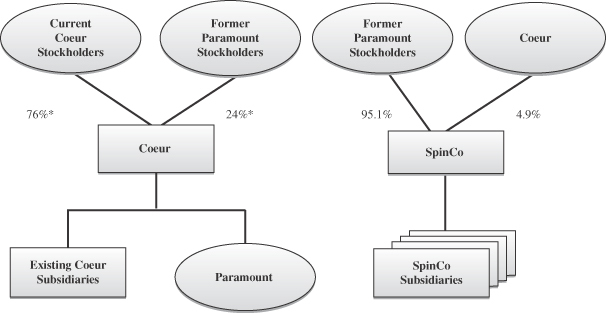 This implies a valuation of $30 million for SpinCo or $0.1761per PZG share which would imply a spread of ~14%. 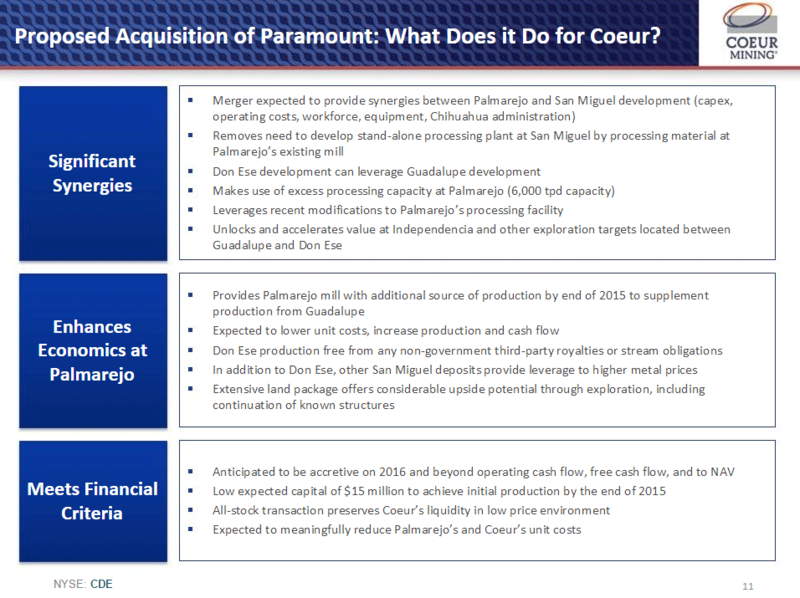 While Coeur and Paramount could have structured the deal to arrive at almost any valuation I think that it is probably a pretty decent estimate of value: I bet their accountants would like to see that a related party transaction occurs at something that resembles fair value. As long as the number is in the right ballpark I’m happy. Chris DeMuth Jr. has a more optimistic take on the valuation in this Seeking Alpha blog post. The value of the gold deposit in Nevada is very leveraged to the price of gold, and if you model a small probability of significant higher gold prices in a few years the value of the deposit increases greatly. I wouldn’t want to bet on that, but optionality is worth something. An additional sweetener to the deal is the fact that a long PZG, short CDE position has a significant positive carry. Borrowing the CDE shares costs around 1% while you can lend your PZG shares at 35%. If you are able to fully capture the high lending fees on the PZG leg you could make an additional return of 1.4% in the 15 days that it will take before the merger closes. Capturing the full spread will be difficult for most, but it should be a nice bonus. The high borrow fee for PZG is at the same time also a risk factor because you have to ask what the shorts know what you don’t. In this case, I think the high borrow fee can be partly explained by an inefficient lending market. Just 7.4% of the PZG shares have been sold short, and this percentage has been declining since last year. CDE has actually 12% of the float sold short, but probably because it’s a bigger and more liquid company it also has a more efficient lending market. I think it’s reassuring to know that the shorts aren’t betting against the merger. The company might not be great, but that’s to be expected when you look at an exploration stage mining company. Betting against that group was (is?) a pretty decent trade. This entry was posted in Portfolio and tagged CDE, PZG on April 2, 2015 by Alpha Vulture. You can also wait till the stub starts trading and pounce if the value goes well below 30M, which seems likely since many people will unload a strange ticker that just pops up in their account. Perhaps. The spinoff itself could also become an opportunity, but that doesn’t make the current deal less attractive IMO. Yeah, I noticed that. Hope we’ll see the same kind of action when the spin-off starts trading. Is that PZG WI quote at a 20:1 ratio compared to what SpinCo will actually trade at post merger? Meaning, a quote of $1.40 in PZG WI is equivalent to $.07 for SpinCo?